Is Bottled Better Than Tap Water for Your Kids? Bottled water has gotten very popular these days. In addition to being convenient, some parents have the idea that is also safer and healthier for their kids. Does bottled water have any benefits over tap water besides being convenient? Not really. It isn't safer or healthier. In fact, in many cases, the bottled water that you buy is simply the tap water from a major city that goes through a filtration process before it is put into all of those little plastic bottles. If you don't like the taste of your tap water, which is another reason people often use for drinking bottled water, then consider getting an inexpensive water filter for your tap. Alternatives include water filter pitchers or larger dispensers that go in the refrigerator or a built-in filter for your refrigerator's water dispenser. You can even get reusable water bottles with a built-in water filter. Fortunately, simple faucet, refrigerator, and pitcher type water filters, like from BRITA and PUR don't filter out fluoride. A more sophisticated reverse osmosis system likely will, though, so talk to your pediatrician or pediatric dentist about fluoride supplements if you have one in your home. According to the American Academy of Pediatrics, infants begin to need fluoride supplements when they are six months old. If your local drinking water (tap water) contains at least 0.3 parts per million (ppm) of fluoride, then it is usually best that they get that fluoride from fluoridated water. While you can instead give your child fluoride drops, there is the risk that he will get too much fluoride if he also drinks fluoridated water and gets too much fluoride, which can cause tooth staining (fluorosis). In addition to fluoridated tap water, you can also buy bottled water with added fluoride, including 'nursery' water for babies. There is another alternative to bottled water and tap water—well water. 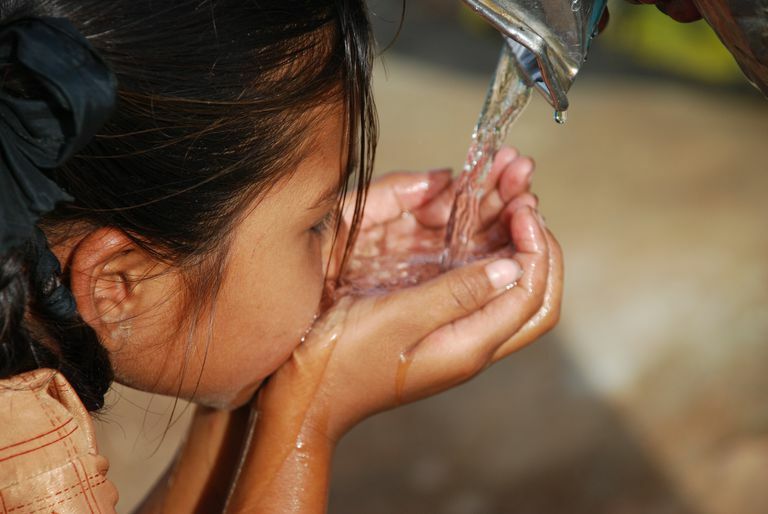 Many families still get their water from private wells, which can be a source of nitrates, volatile organic compounds, pesticides, bacteria, lead, and other substances. Well water can also have naturally occurring fluoride although it might not be at recommended levels. All of these factors make it important that the well water is tested before it is used and at least once a year. The American Academy of Pediatrics also recommends that well water be filtered to at least remove lead, Cryptosporidium species, and some volatile hydrocarbons. Kids need to drink water. Well, not necessarily water, but they need to drink and they need fluoride. That makes tap water a great option for your kids. Water doesn't have any calories, which makes it a great alternative to soda, tea, and fruit juice. And it doesn't have any caffeine, like soda or the energy drinks that some teens have started to drink. Plus it's safe and cheap and can be nearly as convenient as bottled water if you use your own reusable water bottles, without all of the extra plastic.